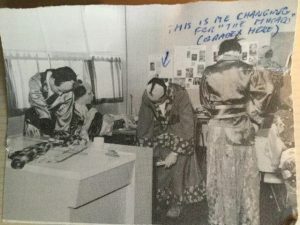 even if it would now be considered cultural appropriation for what my school did in 1964-65 in staging the famous Gilbert and Sullivan musical. The first other language I learned some of in any depth was Japanese, not French: “Miya sama, miya sama, o n’mma no maye ni” . Hard to believe I was once 15 in the male chorus back at Silver Heights Collegiate, Winnipeg, singing fun songs such as “If you want to know who we are”, “A wandering minstrel”, “Behold the Lord High Executioner”, “As some day it may happen that a victim must be found”, “With aspect stern and gloomy stride”, “For he’s gone to marry Yum-Yum”, ” et al. 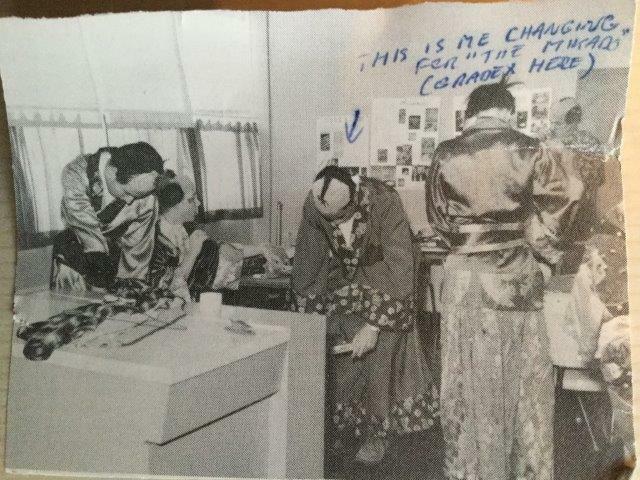 There we were dressed in colorful costumes made by female teachers, the guys wearing the bald wigs, learning Japanese and singing songs written some 80 years before our time. The show ran in early February in the dead of winter for about 4 nights and there would have been a matinee for the school, too. Funny thing is that I only remember us being played a short excerpt from a live recording to give us some sense of what the original sounded like–somewhat fast, choppy, and garbled. I liked our enunciated version much better. That was the first time I had makeup put on me and my third time on stage, the first time musically. 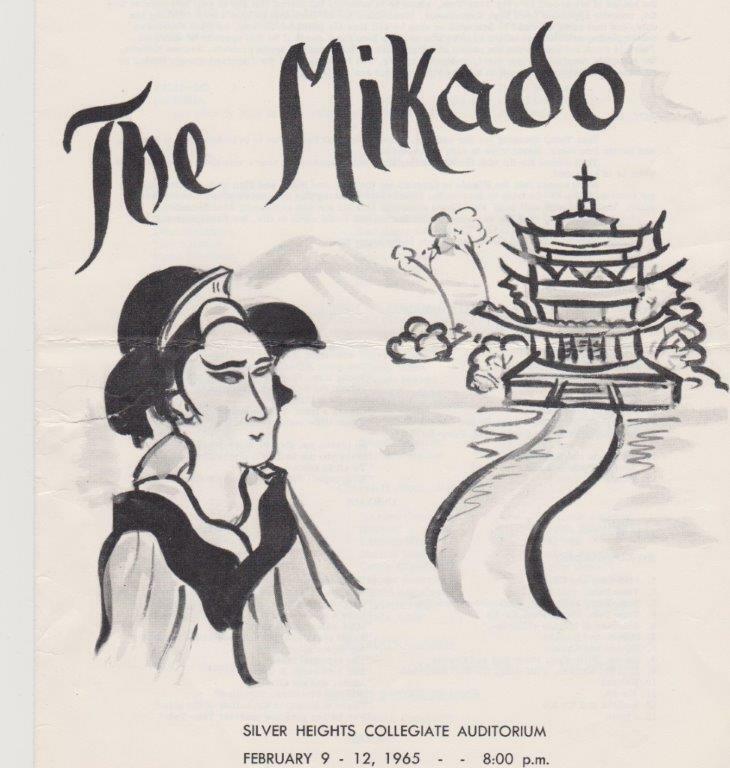 In grade 11 (’65-’66), Barry Anderson, our same fantastic music director–one of the greats of Winnipeg music history–had us do Lerner and Lowe’s Brigadoon and I, again, appeared in the male chorus as Jock McVeigh, notably as a ‘serving tray’ carried across the stage. 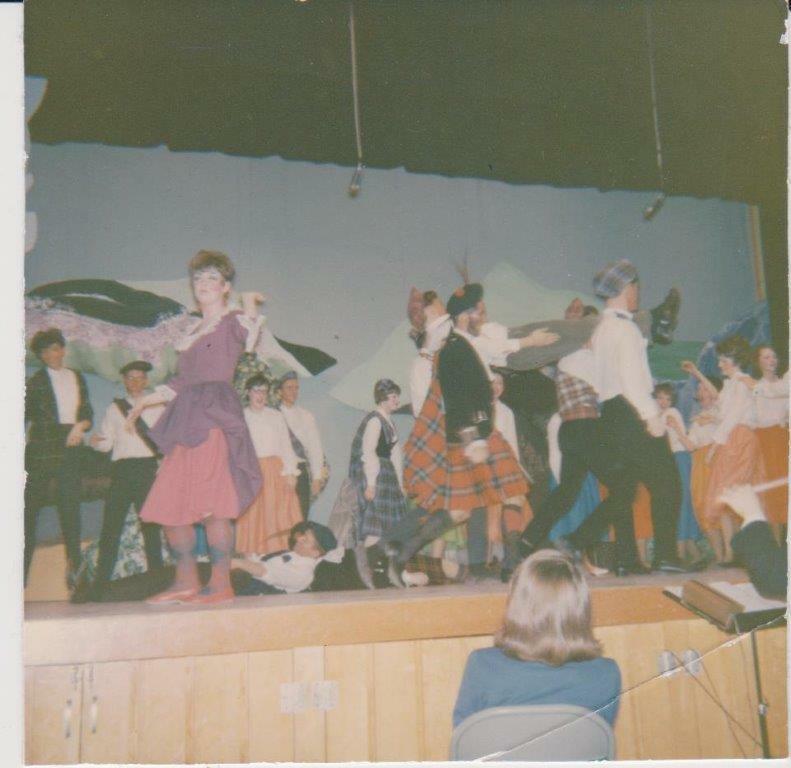 After that, in grade 12 (’66-’67), I finally got a lead part as The Usher in Gilbert and Sullivan’s Trial by Jury, simultaneously playing The Mayor in the school play The Red Velvet Goat, playing the same four evenings. 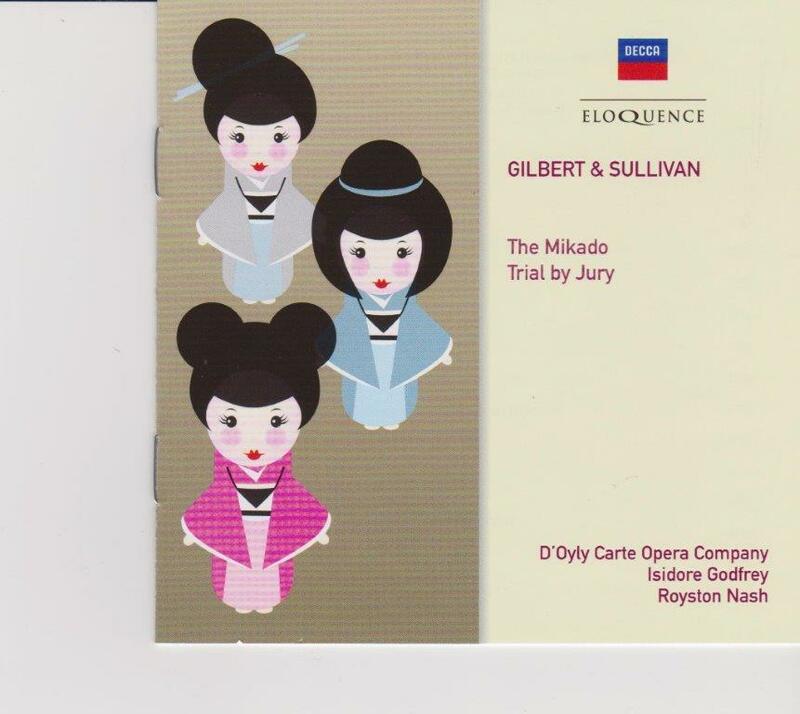 Last evening as I went off to sleep, I finally (with my CD player and headphones by my bed 55 years later) heard the entire Mikado done by pros and many of the songs came back including the “Miya sama” words. It’s actually a fine musical and still fun to hear and imagine the staging of. 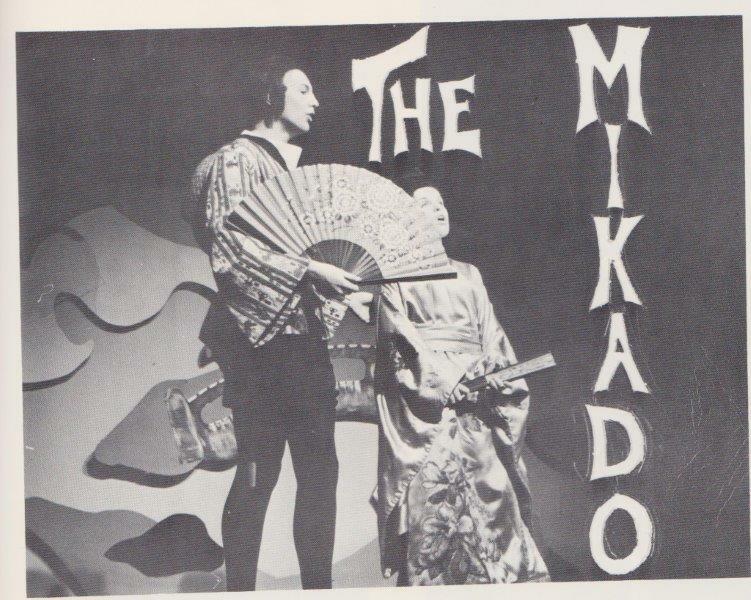 The Mikado, Nanki-Poo, Ko-Ko Pooh-Bah, Pish-Tush, Yum-Yum, Pitti-Sing, Peep-Bo, Katisha–all the old character names and featured songs came back in a rush. 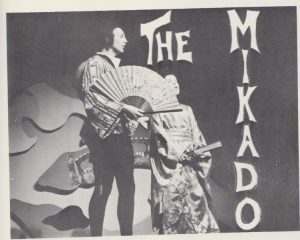 The operetta began its performance decline around 1990 and ran into controversies after that even though G & S were actually spoofing British culture and pretensions beneath the ‘fantasy’ Asian surface. Productions were increasingly cancelled, though in 2016, a modified version debuted. 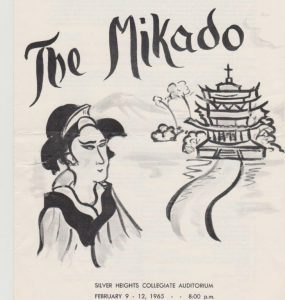 I can only remember this school memory as being incredibly formative and my introduction to Japanese culture, including the lyrics memory work. If you’ve never heard this operetta, I’ve included an image of the CD I was listening to. Because it’s an 1880s operetta written at the height of the Victorian British Empire, it is quite uniquely different from any other music you’ve ever heard most likely.